Lauderdale by the Sea Concrete Vent Blocks from Atlantic Coast Precast will really impress you! We started our business in 1965 and have since then gained a stellar reputation that we work hard to maintain. Our concrete vent blocks are practical because they allow light and air into a space. They are also a great way to make an area for more beautiful. They can truly enhance any architectural design, and are offered in many shapes, sizes, and styles. Contractors, architects, engineers, designers, and other industry professionals love our concrete vent blocks. You will not regret your decision to hire us! Lauderdale by the Sea concrete vent blocks from Atlantic Coast Precast are more affordable than many of our competitors. They help to block heavy winds without blocking ventilation, and are low maintenance. 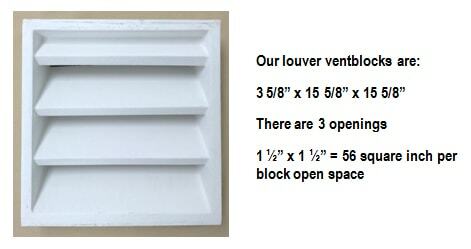 Our vent blocks which are made of a block and a screen also cross-ventilation in foundations, garages, and range hoods. Preventing moisture underneath your foundation is very important. One of the most efficient methods against avoiding moisture damage is by installing foundation vents that will help trapped moisture exit the structure. When you contact us we will review the various styles we have available and help you choose the one which is most suitable for your needs. Our Lauderdale by the Sea concrete vent blocks allow fresh air to naturally flow under structures. This helps to keep moisture level lows. Proper ventilation is very important in keeping moisture levels low. You will even have added protection from termite infestation and damp rot. You will love the high level of quality that our concrete vent blocks come in. Contact us today to get more information. You will be happy that you did!